Every Sunday morning from 10:45-11:30, this group for adults meets for discussion and fellowship. They discuss a chapter in a book related to Unitarian Universalism or enjoy a facilitated discussion about the morning’s sermon or other spiritual or topical matters. On Wednesday nights, the entire congregation is invited to gather for a weekly dinner and Vespers Service. After the worship time, we offer a variety of classes and activities. Among these offerings are Adult Religious Education opportunities which range from multi-week classes to one-time workshops. 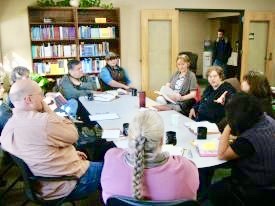 Recent classes have included “Process Theology,” “The Roots of Poverty,” “Comparative Religions-East and West,” “Democracy from the Inside Out” and “Learning Non-Violent Communication.” Recent workshops have included programs about current Unitarian Universalist Association study/action issues, environmental concerns, mental health awareness, and Star Trek. These classes and workshops are led by the Minister, Director of Lifespan Religious Education, and members of the congregation. On a regular basis, BAUUC offers classes and discussions for our new members and visitors to learn about our church and the Living Tradition of Unitarian Universalism. These classes are most often led by our Membership Ministry Team Lead, our Minister, and our Director of Lifespan Religious Education. 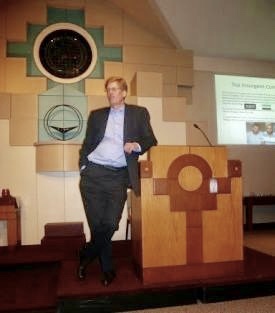 They offer an overview of Unitarian Universalist Principles and Sources, history, governance, and values as well as the opportunity to get to know more about the Bay Area Unitarian Universalist Church community. Each winter, BAUUC offers a popular eight-week foreign policy study-discussionprogram called “Great Decisions.” Each year, participants read articles on current U. S. foreign policy issues in a briefing booklet that is prepared by the Foreign Policy Association (FPA), national sponsor of the program. They then meet in discussion groups to exchange their views on the topics. The discussions are preceded by the showing of a PBS video that updates the information presented in the briefing booklet. Discussions are led by trained facilitators. Participants then complete opinion ballots which are tabulated by FPA with results being distributed to the President, Secretary of State, Members of Congress and the media. Prominent speakers from the area and other parts of the country address many of the topics prior to the discussion group meetings, usually University professors and retired diplomats. The groups are open to church members and to the community at large. 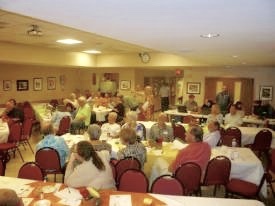 Members and friends participate in monthly “Connection Groups” which offer the opportunity to get to know others better and explore their spirituality in a safe and comfortable atmosphere. These groups of 8-10 people are led by trained facilitators and meet on various days and times at the church for one church year. Bay Area UU Church is pleased to offer an annual speaker series each winter and spring for the wider Clear Lake community. In the past year we have hosted noted experts on various foreign relations topics, religious perspectives and global politics. Numerous additional classes, workshops and discussion groups are presented throughout the year. Please check the latest edition of our Universe magazine for the current schedule of offerings. The Universe is published on the first day of each month.